Just a thought …… about Harper Lee’s Maycomb, Alabama and other related settings…. Middle Earth, Narnia, and Wessex are all examples of exotic, or parallel-world settings created by novelists to base their stories in. Novelists have always created these imaginary worlds for their own purposes. Middle Earth is the fictional universe created by Tolkien for his best loved works The Hobbit and The Lord of the Rings. C.S. Lewis goes to great rounds to create another fictional realm for his seven Narnia books which make up his Chronicles of Narnia. Thomas Hardy’s Wessex Novels are situated in a ‘partly real, partly dream country’. 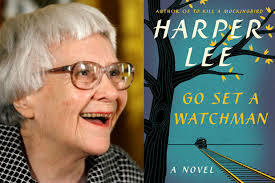 Being a Harper Lee fan I’ve been awaiting Go Set a Watchman with eager anticipation since the old PR machine kicked into gear earlier in the year. For the purposes of this blog, however, I just want to focus for a little while on the setting of both novels, and novels in general, and it is clear to me that the real life Monroeville, Alabama of her youth becomes the fictional Maycomb, Alabama of her novels. Lee sets her novels here for a reason: she deliberately selects her setting, and in effect the fictional Maycomb becomes another Narnia or Middle Earth – a microcosm of all that is good and bad in 1930’s America. She tells us that one went to Maycomb, ‘to have his teeth pulled, his wagon fixed, his heart listened to, his money deposited, his soul saved, his mules vetted’. She describes it as an isolated place, in effect it is an Everyplace – the town, ‘had remained the same for a hundred years, an island in a patchwork sea of cotton fields and timber land’. It is, in effect, a remote backwater bypassed by progress, the perfect playground of her youth, and the perfect cauldron for change. In To Kill a Mockingbird she continues in the same rich vein. Maycomb is, ‘a tired old town’. People moved slowly, ‘they ambled across the square, shuffled in and out of the stores around it, took their time about everything’. She tells us that, ‘There was no hurry, for there was nowhere to go, nothing to buy and no money to buy it with, nothing to see outside the boundaries of Maycomb County’, a scenario somewhat reminiscent of modern day Greece! The setting of George Eliot’s novel, Silas Marner, has many echoes of Maycomb in Eliot’s fictional depiction of Raveloe. Eliot tells us that it, ‘was a village where many of the old echoes lingered, undrowned by new voices.’ She further describes it as being, ‘Not …. one of those barren parishes lying on the outskirts of civilization — inhabited by meagre sheep and thinly-scattered shepherds: on the contrary, it lay in the rich central plain of what we are pleased to call Merry England’. However, like Maycomb it was off the beaten track, ‘it was nestled in a snug well-wooded hollow, quite an hour’s journey on horseback from any turnpike, where it was never reached by the vibrations of the coach-horn, or of public opinion’. Much of this abundance is of course meant to contrast with Silas Marner’s previous place of residence in Lantern Yard. Whereas Lantern Yard had been austere, white-walled, and filled with serious and devout Puritans, Raveloe is a place of lazy plenty, pints at the local tavern, and carefree religion on Sundays. Chapter One declared it to be a place where bad farmers are rewarded for bad farming! This description of Raveloe also holds great echoes with The Village as depicted in Jim Crace’s latest (and last?) novel, Harvest. The narrator, Walter Thirsk tells us that, ‘these fields are far from anywhere, two days by post-horse, three days by chariot, before you find a market square.’ Harvest dramatises one of the great under-told narratives of English history: the forced enclosure of open fields and common land from the late medieval era on, whereby subsistence agriculture was replaced by profitable wool production, and the peasant farmers dispossessed and displaced. “The sheaf is giving way to sheep”, as Crace puts it here, and an immemorial connection between people and their local environment is being broken – their world is crumbling around them. Great changes are coming and, as everyone knows by now, the only people who welcome change are babies with wet nappies! Brian Friel’s use of Ballybeg (small town) as the setting for many of his plays and short stories is also similar in vein to these others. In Philadelphia Here I Come, Gar Public tells us that Ballybeg is, ‘a bloody quagmire, a backwater, a dead-end’. Friel, like Lee, and Eliot and Crace is deceptive because he is dealing with familiar things and familiar characters – shopkeepers, housekeepers, and parish priests – a very familiar rural Ireland fixed in its own time. Friel’s use of the alter ego – Public Gar and Private Gar – allows us the opportunity to see behind the superficiality of so much of this world of small-town life. In many ways Friel’s major theme is the failure of people to communicate with each other on an intimate level. In this play especially we are introduced to the typically Irish practice of verbal non-communication! He, like Harper Lee, George Eliot, and Jim Crace, forces us to examine the nature of society. In Ireland our society in the 40’s and 50’s was dominated by the church, the politician and the schoolmaster. Ultimately the world that Gar is leaving has failed him and his generation. But Friel is too subtle to allow us to imagine that the world Gar is about to enter in Philadelphia will be any better. These meandering rambles are an attempt to place myself at the beginning of a work of fiction, to stand for a moment in the author’s shoes, so to speak, and see the world from their point of view. From my limited reading it seems to me that many authors deliberately choose a world untrodden, less travelled as the setting for their novel. I have mentioned some here in this piece but I’m sure this is just the tip of the iceberg and you will be able to reference many examples from your own reading. Ideally the setting is always remote, secluded, off the map or often off the mainland, cut off from change and advancement. This microcosm is then filled with characters and fictional dilemmas, action and inaction. I have always been truly fascinated and overawed by each author’s unique ability and ingenuity in creating and imagining these hidden places and thus allowing us the privilege of entering the world of their texts.